WE ALL have different motives for building kick-arse street machines. For many it’s the ‘ooh-ahh’ value they get when they take their jalopy for a cruise on Saturday night. For others, it’s the swag of trophies they haul home from the show ’n’ shine or dyno competition. But what we seem to see less of these days — and it’s probably the ingredient most of our cars could do with more of — is driveability. Does it stop better? Does it go better? Is it fun? Is it reliable? Is it practical and, most of all, is it legal? You’d have to search far and wide before you came up with a car that answered all those questions better than Andrew Wansey’s Valiant Wayfarer ute. “I didn’t really plan for things to go this far,” Andrew laughs. “I wanted something that wouldn’t make the enthusiasts cringe if I started to cut it up, like they would over an E49 or a Pacer. I wanted something I could thrash, that would hold its own on the street or at the strip. He drove it a good deal further before discovering it had some nasty rust issues in the plenum, just in front of the screen, so he took it to Ray Webb at Pentastar Parts & Repairs, in Sydney’s western suburbs. Which he did. “I started thinking about repowering the car,” Andrew says. “I figured it would make the whole project more meaningful so I sourced a good 340 and 727 auto from the US. It had a steel crank, forged rods and big-port X heads — just what we wanted. While the car was on the rotisserie in the shop, Andrew decided to fit an AlterKation front-end with drop spindles, tubular control arms, QA1 coil-over shocks, four-spot Wilwood brakes, and rack and pinion steering. Pentastar Parts & Repairs took over the entire build of the car and fitted a set of mini-tubs to the rear. Rather than go for a heavy nine-inch diff, Ray shortened and braced a BorgWarner unit and fitted it with 3.89:1 gears, Falcon disc brakes and an LSD. The rear springs were also lowered and relocated inside the chassis rails to clear the 17x11 rims and 315 tyres. Simple but unique changes make the car stand out like a factory one-off. A right-hand drive Dodge Dart dash fascia by Rocky Mountain Dashes is filled with Stewart Warner gauges. It sits well with the ’68 Dodge Charger Grant tiller and the retrimmed VE Valiant low-back bucket seats. All the chrome was blasted and painted in brushed alloy to match the bumblebee stripe across the rear. “Everything was done by the book: paint stripped, lead wiped and file finished before sitting in polyester and eventually being baked in two-pack,” Ray says. 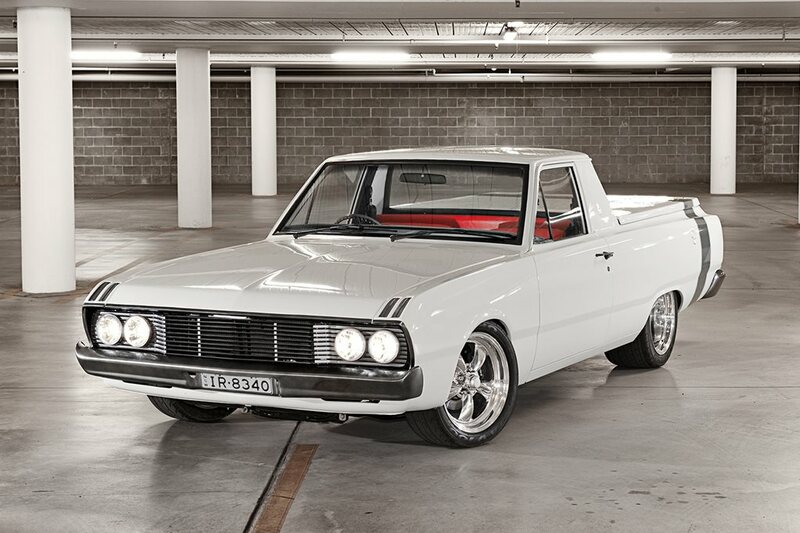 Finished in Alpine White and rolling on Torque Thrust wheels, the ute has the classic Mopar image with an aggressive road stance. Look under the front end of any Aussie Valiant, or 60s to 70s US Mopar muscle, and you’ll find torsion bars rather than coil springs holding it up. They’re simple and they work, but they’re also 50-year-old technology. Other than swapping in stiffer torsion bars or better shocks, there hasn’t been too much you can do to improve them — until now. Reilly Motorsport in the States has created the bolt-in AlterKation kit that not only replaces the torsion bar front end with coil-over suspension, but it also adds rack and pinion steering plus a choice of engine fitments and brake upgrades. The upgrade in suspension technology alone makes the conversion worthwhile but removing the torsion bars and steering box also clears space for a free-flowing exhaust. And the best bit? You can buy the kit right here in Australia from Pentastar Parts and Restorations (02 9608 8888). The AlterKation kit starts at $7500 using the customer’s brakes; you can add options from there. The tubular upper arms are available individually for those who don’t want to go the whole hog.